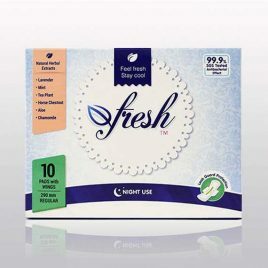 Afresh pads are designed for women looking for a truly fresh feeling and/or who are troubled with discomfort when wearing a sanitary towel. Afresh pads may NOT suit everybody. Therefore, we recommend you try a sample pack. Please read FAQ before you order. Postage and packaging fees apply to sample orders: £0.30 per item. Medical Disclaimer: All results were conducted by a third party. Afresh Ltd DOES NOT MAKE ANY MEDICAL CLAIMS. If you have a medical condition or questions or concerns please consult with your medical professional before usage. FREE DELIVERY ON ALL ORDERS OVER £5 Natural herbal extracts ingredients Anti-bacterial effects Liquid-Locking Gel, can't leak Soothe itchy skin Fresh Feeling for up to 12 hrs With wings to keep it in place AFRESH Pads Day Use Pads with wings are the first menstrual pads with herbal anti-bacterial effects, which not only can soothe itchy skin and neutralize odour, but also truly give women the freshing and cooling sensation for up to 10 hours. It can absorb 10x its weight than normal pads. 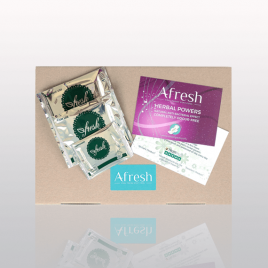 TRY AFRESH SAMPLE PACK, CLICK HERE TO ORDER. ADVISORY INFO Medical Disclaimer: All results were conducted by a third party. Afresh DOES NOT MAKE ANY MEDICAL CLAIMS. If you have a medical condition or questions or concerns please consult with your medical professional before usage.